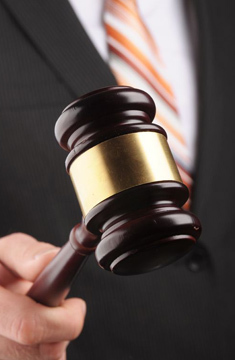 Auction is a way of selling property through intensive advertising media designed to capture the maximum attention of customers within a set time frame. The process is a means of purchasing/selling real estate through public negotiations to determine the true market value of the property at that time. For more information about selling your property at Auction, download our 'Under the Hammer' booklet. A high profile, set marketing campaign will ensure your property has prominence; you can plan with confidence. No price marketing attracts a wider range of potential buyers. More buyers see your property. Auctions create buyer competition which helps achieve a premium price. The auction day deadline sets a finite selling period and creates a sense of urgency amongst buyers. This could well induce offers prior to auction. Property Brokers sell over 10% of auction properties before auction day. You remain free to consider any offers before your auction day if you choose. You are in control. You set the reserve price with our guidance and select the possession date. An auction sale is an unconditional cash sale. Normally 10% of the purchase price is paid on the fall of the hammer, with the balance in 60 or 90 days. You set the terms of the sale. The property sale is usually made with our standard terms and conditions and any special requirements you have added in. Finance - We can assist buyers with arranging finance prior to auction. Open home times are arranged to cause you minimum inconvenience. You will be kept fully informed. Good news and bad about the auction campaign and any comments relating to your property. At worst, if your property does not sell under the hammer on auction day, we will have identified all interested parties and many sales are made within a few days of the auction. Because the auction process can be confusing to new buyers and sellers, answers to some frequently asked questions are listed below. The reserve is the minimum figure that the auctioneer is instructed to sell the property for on auction day. This figure is generally established as a result of feedback from interested parties during the marketing period and is usually set by the client prior to the auction. How do people bid at the auction? Raising a hand; or Calling out a bid; or Nodding when they catch the auctioneer's eye. The successful bidder will be asked to pay the 10% deposit and sign the auction contract. Yes, in most cases you can. This is called a pre-auction offer. A customer may submit an offer on the Auction Particulars and Conditions of Sale Agreement. If this offer is acceptable to you, all other registered customers are given the opportunity to submit their offers if they wish to. You can then decide which offer suits you best. Can someone bid when they need to get finance? Because interested parties must be in a position to bid on a cash unconditional basis at the auction, they are advised to organise pre-approval through their bank or mortgage broker to bid up to a price they are prepared to pay. Can someone bid when they have a property for sale? If they are in a sound financial position they may arrange bridging finance to cover any delay in settling their property. They may request a longer settlement date, giving them time to sell and to settle their property.